Description: Jean-Michael Basquiat and his unique, collage-style paintings rocketed to fame in the 1980s as a cultural phenomenon unlike anything the art world had ever seen. But before that, he was a little boy who saw art everywhere: in poetry books and museums, in games and in the words that we speak, and in the pulsing energy of New York City. Now, award-winning illustrator Javaka Steptoe's vivid text and bold artwork echoing Basquiat's own introduce young readers to the powerful message that art doesn't always have to be neat or clean--and definitely not inside the lines--to be beautiful. Review: Radiant Child won the prestigious Caldecott Award last year for the best picture book for children. 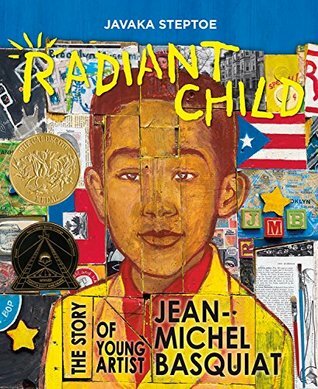 In this vibrant, colorful, energetic picture book we learn about the biography of artist Jean-Michel Basquiat, an artist that I was not familiar with before picking up this book. We are introduced to the artist's childhood and early career. Born in Brooklyn with a mixed heritage of Puerto Rican and Haitian, Basquiat loved art at an early age and was encouraged to pursue his dream of being a famous artist by his equally artistic mother. The artwork mirror's Basquiat’s signature style of eclectic pieces that weirdly work together. At first glance the illustrations can be chaotic and too busy until you take your time and dissect the layers. The illustrations also highlight some of Basquiat's trademarks such as the golden cartoon crowns, eyeballs, and vehicles scattered everywhere. Though we do get a glimpse of his mother dealing with mental health issues, there are no mentions of the troubles with addiction and early death that I found out after doing some research after reading this book. Considering it's a book for children, I think the writer made a good decision in having the book end with Basquiat achieving his dream and quotes of people talking about his work. Words of Caution: There is mention that Basquiat's mother was taken away to a facility in order to get treatment for her mental health issues. Recommended for Grades 1-5. Description: Louis Braille was just five years old when he lost his sight. He was a clever boy, determined to live like everyone else, and what he wanted more than anything was to be able to read. Even at the school for the blind in Paris, there were no books for him. And so he invented his own alphabet—a whole new system for writing that could be read by touch. A system so ingenious that it is still used by the blind community today. 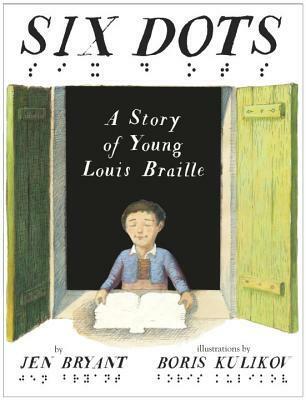 Review: Six Dots is a pictorial biography on the Louis Braille's life. As a child, Louis Braille was curious and energetic. Sadly, an accident blinded him in one eye and he lost his other due to a spread of infection. Though Louis learned to navigate daily life, he missed the knowledge gained through reading, and applied to the Royal School for the Blind, where books with raised letters provided a slow and unsatisfying alternative. When he was introduced to a French military code written in patterns of dots, Braille wondered if this would be a more suitable alternative to the raised letters and if it could be expanded into an actual language. Though I liked the way the book was written, I thought it was a bit too text heavy for young readers. I would have liked an inclusion of actual Braille in the book instead of the simple diagram of the Braille alphabet on the endpapers. Still, I think this is an important read based on the life of a very worthy inventor. Description: Stepping Stones tells the story of Rama and her family, who are forced to flee their once-peaceful village to escape the ravages of the civil war raging ever closer to their home. With only what they can carry on their backs, Rama and her mother, father, grandfather and brother, Sami, set out to walk to freedom in Europe. Nizar Ali Badr's stunning stone images illustrate the story. 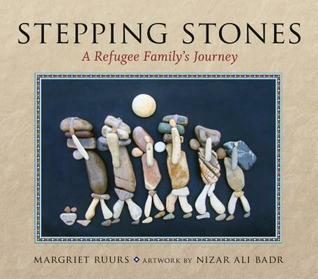 Review: Stepping Stones is a heartbreaking and timely picture book depicting the plights of Syrian refugees who are forced to leave their homes and start their life over in a new country. The text is simple yet direct, written in blank verse and in dual English and Arabic. What steals the spotlight in this book is the the artwork, stone-collage illustrations created by Syrian artist Badr, who arranges the stunning, tactile creation of people formed entirely of rocks and pebbles (enlarge the book cover to get a sense of what I'm talking about). On every spread, a round pebble hovers over the refugees, providing light, like the moon or sun, as well as hope. I would highly recommend getting this book simply for the art itself. This is a unique picture book that I hope will open eyes, create empathy and understanding. Words of Caution: None, but young readers will need background information about what is happening in Syria and about refugees. Recommended for Grade 3 readers and up. Great reviews for both of these, they are both new to me. I love coming here and always seeing new and interesting reads to try! 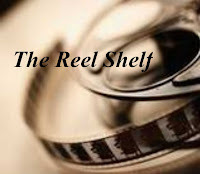 Very interesting and eclecitc book mix this week. They all sound good. I am disappointed though, like you, that there wasn't Braille in the book. I remember reading Helen Keller when I was young and being fascinated by the Braille. I don't often read children's books anymore but now I want to read all three of these. I don't recall ever reading a picture book that was as serious as the topics provided here ^^ But they do definitely have a place, I think. Nice way to open up dialogue with your loved little ones.